New ListingMario Party 3 (Nintendo 64, 2001) - Authentic- Works Great! Mario Party 3 (Nintendo 64, 2001) - Authentic- Works Great!. Condition is Very Good. Shipped with USPS First Class Package. 4.5 out of 5 stars - Mario Party 3 (Nintendo 64, 2001) - Authentic- Works Great! 157 product ratings157 product ratings - Mario Party 3 (Nintendo 64, 2001) - Authentic- Works Great! Trending at $50.49eBay determines this price through a machine learned model of the product's sale prices within the last 90 days. Item - Up for sale is the item exactly as shown in the picture(s). If not paid for by the 7th, the item will be relisted. Trending at $63.98eBay determines this price through a machine learned model of the product's sale prices within the last 90 days. This is for one copy of the game that is pictured. Pictures are of the actual items. See the full listing for more details. Original Authentic Paper Mario (Nintendo 64 N64, 2001) Authentic Super Mario . Condition is Good. Shipped with USPS First Class Package. Tested on my N64 and it plays and saves as it should. Please see pics for condition, this is the exact game you will receive. SCOOBY DOO CLASSIC CREEP CAPERS. ORIGINAL BOX W/ MANUAL. PAPER MARIO. IN THE ORIGINAL BOX W/ MANUAL. 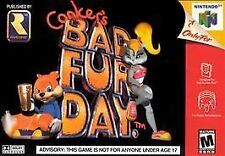 Conker's Bad Fur Day (Nintendo 64) Box Manual Complete CIB N64 Nintendo 64. Condition is Good. Box is not perfect and game has a few marks on it as shown in the pic. May be able to get them off with a magic eraser. Have not tried. Shipped with USPS First Class Package. Trending at $17.65eBay determines this price through a machine learned model of the product's sale prices within the last 90 days. Paper Mario (Nintendo 64) N64, Works! Cartridge Only. Condition is Very Good. Shipped with USPS First Class Package. Mario Kart 64. Madden 2001. Paper Mario (Nintendo 64, 2001) N64. Condition is Good. Shipped with USPS First Class Package. Cartridge only. Super Bowling (Nintendo 64, 2001)authentic works great Free Shipping! You are bidding on a authentic copy of Super Bowling. This game plays great and has nothing wrong with it. 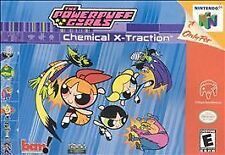 I'm just selling cause I bought a complete copy. It has some writingon the front. LOOK AT PICS! Happy Bidding! Check out our other auctions! Selling off a bunch of high dollar games! 5 out of 5 stars - Super Bowling (Nintendo 64, 2001)authentic works great Free Shipping! 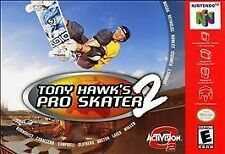 2 product ratings2 product ratings - Super Bowling (Nintendo 64, 2001)authentic works great Free Shipping! Paper Mario (Nintendo 64 N64, 2001) Authentic Super Mario . Condition is Good. Shipped with USPS First Class Package. 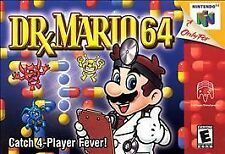 New ListingPaper Mario (Nintendo 64, 2001) - Authentic - Works Great! Paper Mario (Nintendo 64, 2001) - Authentic - Works Great!. Condition is Very Good. Shipped with USPS First Class Package. What you see in the picture is what you will be getting. 4.5 out of 5 stars - Original Factory Sealed Mega Man 64 N64 (Nintendo 64, 2001) 100% Authentic! 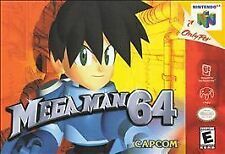 45 product ratings45 product ratings - Original Factory Sealed Mega Man 64 N64 (Nintendo 64, 2001) 100% Authentic! Color may vary from the one in the picture. Mario Party 3 (Nintendo 64, 2001) - Authentic- Works Great! Pokemon Stadium 2 - (Nintendo 64, N64, 2001) - game only - excellent condition! Paper Mario (Nintendo 64, 2001) - Authentic - Works Great!